There is no universally accepted definition of a patient fall. In fact, The Joint Commission (TJC) allows each accredited facility to determine what constitutes a patient or resident fall (TJC, 2008). Some fall definitions are succinct; an event which results in a person coming to rest inadvertently on the ground or floor or other lower level (WHO, 2012). Some are detailed; “loss of upright position that results in landing on the floor, ground or an object or furniture or a sudden, uncontrolled, unintentional, non-purposeful, downward displacement of the body to the floor/ground or hitting another object like a chair or stair” (VA National Center). Others provide guidance; “fall” refers to unintentionally coming to rest on the ground, floor, or other lower level, but not as a result of an overwhelming external force (e.g., resident pushes another resident). 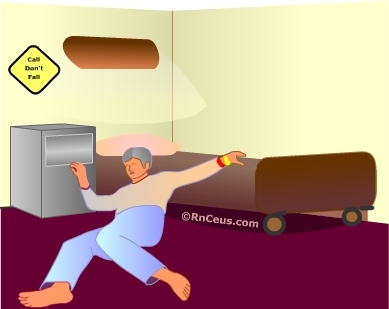 An episode where a resident lost his/her balance and would have fallen, if not for staff intervention, is considered a fall. A fall without injury is still a fall. Unless there is evidence suggesting otherwise, when a resident is found on the floor, a fall is considered to have occurred (DHHS). HAC is defined by the Centers for Medicare & Medicaid Services as conditions that are: (a) high cost or high volume or both, (b) result in the assignment of a case to a DRG that has a higher payment when present as a secondary diagnosis, and (c) could reasonably have been prevented through the application of evidence-based guidelines. In other words, preventable, serious injury that resulted from care provided to the inpatient. Rehabilitation units – 3.61 falls per 1000 patient days (He et al., 2012). Of the patients who fall, 3% to 20% will sustain an injury, 6% to 44% of those injuries are serious, such as fractures, subdural hematomas, excessive bleeding all of which can lead to a death. Even minor injuries can cause delay in recovery (Oliver et al., 2010). The Agency for Healthcare Research and Quality (AHRQ) reported in its handbook, Patient Safety and Quality: An Evidence-Based Handbook for Nurses), every year inpatient falls resulted in 90,000 serious injuries and 11,000 deaths in American hospitals (Hughes, 2008). Patient fall risk should be a integral part of the initial nursing assessment in most acute and long-term care settings. In addition, the patient's fall risk should be reassessed whenever a health status change occurs. The Morse Fall Scale (MFS) is a popular fall risk assessment tool. The MFS has been validated in a number of settings and has been found to be most useful when the intervention cut-off values are adjusted to reflect the fall rate in a particular care setting. Fall prevention demands a high level of organizational commitment. Every level of the organization has a role to play from resource allocation by administrators to continuous facility safety maintenance by ancillary staff. Nursing is critical to fall prevention success. Evaluate every patient for fall risk using a standardized and unit validated assessment tool on admission and whenever treatment or patient conditions changes. The United States Department of Veterans Affairs is a leader in patient safety. In 1999 the VA established a National Center for Patient Safety. The VA generously offers its Falls Toolkit online. Center for Disease Control and Prevention: Preventing Falls among Older Adults online. Staggs, V.S., Mion, L.C., Shorr, R.I. (2015).Consistent differences in medical unit fall rates: implications for research and practice. J Am Geriatr Soc., 63(5)983-7. He, J., Dunton, N., Staggs, V. (2012). Unit-level time trends in inpatient fall rates of US hospitals. Med Care., 50(9) 801-7. Oliver, D., Healey, F., & Haines, T.P. (2010). Preventing falls and fall-related injuries in hospitals. Clin Geriatr Med. ,26(4)645-92. Hughes, R. G. (2008). Patient Safety and Quality: An Evidence-Based Handbook for Nurses. Currie, L. Chapter 10 Fall and injury prevention. Rockville, MD: Agency for Healthcare Research and Quality.